For those looking for the ultimate cruiser skateboard or wanting a little more plastic under your feet to help with balance, the 27″ nickel size is the one for you! Get a PIZZA THIS! You asked and we listened with the perfect pizza themed Penny board. For all those who succumb to the allure of pizza, this board will make you drool with delight. Our 27″ Mozzarella Penny Board is too delicious to miss, it won’t affect your waistline… just the time in which you make it to the pizza shop! 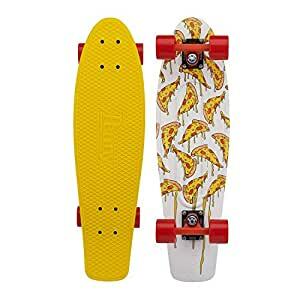 A mozzarella yellow deck with pepperoni like red wheels will keep you skating all day, whilst the mouth-watering pizza graphic underneath will keep you craving more. This 27″ Mozzarella Penny Board is built from the highest quality materials with plastic unlike any competitors, keeping you skating safer for longer. With the right amount of flex and strength, this penny board will have you hugging the tightest of corners with ease, whilst the waffle-top deck will keep your feet put. Pepperoni coloured 59mm 83A wheels and quality Abec 7 bearings allow the smoothest of rides, whilst displaying the tastiest of colours. Made from high quality, chip-resistant formula, these wheels are designed to last and will keep you cruising well into the future. Black powder coated trucks complete the pizza theme of this Penny board. The high-quality aluminium construction of Penny trucks keeps your ride light and strong, while the cushions make sure you’re ready to carve. Tighten them or loosen them to suit your riding style. The 27″ Mozzarella Penny Board features black high tensile deck bolts.